26 CROWLEY MARITIME CORPORATION U.S. federal authorities called it the most logistically challenging relief effort the United States has ever managed. When the nearly-Category 5 Hurricane Maria struck Puerto Rico in 2017, it left a wake of destruction that residents and emergency responders are still reckoning with. When the hurricane hit in September 2017, the U.S. government turned to Crowley to help the island, which is 1,000 miles from the closest city in the continental U.S. As a longtime Jones Act shipping line and leading provider of supply chain services between the U.S. mainland and Puerto Rico for more than 65 years, Crowley was in the unique position to provide responding agencies and the island's businesses with dependable, adaptable services that could meet the scale of the crisis. Government officials knew of Crowley's reputation and capabilities from the company's previous rapid expeditionary response efforts around the world. Ultimately, Crowley's unique capabilities and experience in Puerto led to the company managing the logistics and transportation of more than 100,000 TEUs (20-foot containers or equivalents) of government relief and commercial cargo to help sustain people's lives and support the island's recovery. The company served as the primary transportation logistics manager for the Federal Emergency Management Agency (FEMA) and supported rebuilding activities by the U.S. Army Corps of Engineers (USACE); quickly and repeatedly loading U.S. vessels with relief cargo including food, water, generators, medical supplies, equipment and fuel, as well as transporting power poles, electrical transformers, and other infrastructure. The Crowley-managed supply chain for the government stretched from the U.S. Northwest to the island. Rebuilding the power supply grid and other infrastructure continues to be a work in progress for both residents and businesses more than a year later. But Crowley and its employees are steadfast in their commitment to serving Puerto Rico. "The mood on the island is one of resilience, togetherness," said the company's Wally Gonzalez, director, logistics, a Puerto Rico native with family on the island. "People are taking this all in as a part of daily life. But it's taxing emotionally." 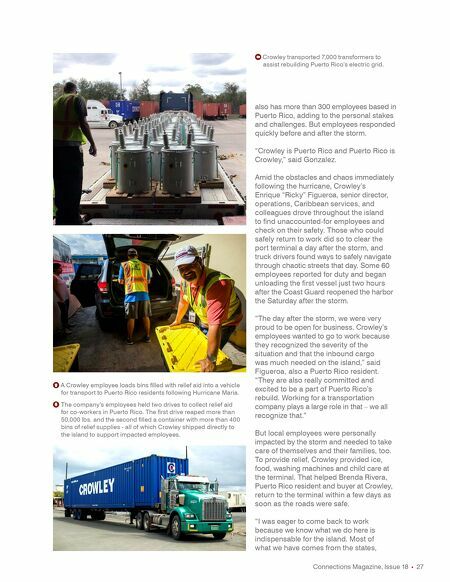 Preparation and Dedication As the hurricane made landfall on Sept. 20, 2017, responding to the challenge wasn't just business for Crowley. 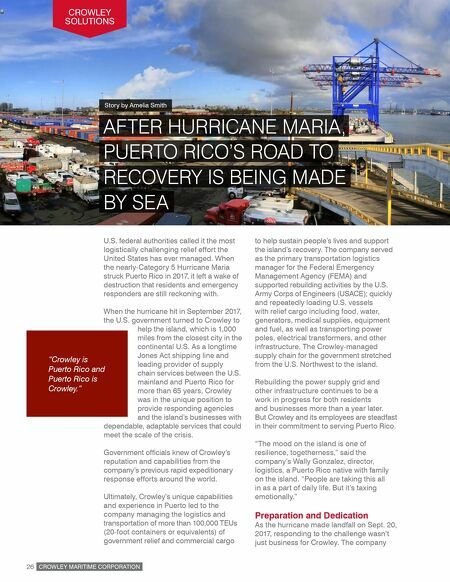 The company CROWLEY SOLUTIONS RECOVERY IS BEING MADE PUERTO RICO'S ROAD TO AFTER HURRICANE MARIA, Story by Amelia Smith BY SEA "Crowley is Puerto Rico and Puerto Rico is Crowley."